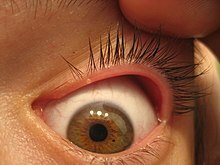 Blepharitis that localizes in the skin of the eyelids might cause styes or chalazia, which appear like red bumps, often with a yellow spot if infection is present. Although pain is not common among blepharitis symptoms, if the condition persists or becomes painful, the individual is recommended to seek medical attention. Chronic blepharitis might result in damage of varying severity which might have a negative effect upon vision and therefore upon the eyeglass prescription. Infectious blepharitis can cause hard crusts around the eyelashes which leave small ulcers that might bleed or ooze after cleaning. Staphlycoccal blepharitis is caused by infection of the anterior portion of the eyelid by Staphylococcal bacteria. As the infection progresses, the sufferer might begin to notice a foreign body sensation, matting of the lashes, and burning. Usually, the primary care physician will prescribe topical antibiotics for staphylococcal blepharitis, as this is an acute condition and should heal quickly. The condition can often lead to a chalazion or a stye. Staphylococcal blepharitis is a more severe condition which might start in childhood and continue through adulthood. It is commonly recurrent and it requires special medical care. The prevalence of Staphylococcus aureus in the conjunctival sac and on the lid margin varies among countries, apparently according to climate. It is important that this type of blepharitis is perfectly treated because otherwise the infection might spread to other parts of the eye or to the scarring of the cornea. Staphylococcal blepharitis is normally treated with antibiotics such as Chloramphenicol ointment. Fusidic acid is usually the choice of antibiotics in cases when Chloramphenicol is contraindicated. Antibiotics are given for at least four weeks and up to six weeks, which is considered enough so the infection is completely cured. Also, blepharitis treatment includes a short cure of topical steroids which are administered to control the inflammation.